And we thought Super Ghouls'n Ghosts was tough. 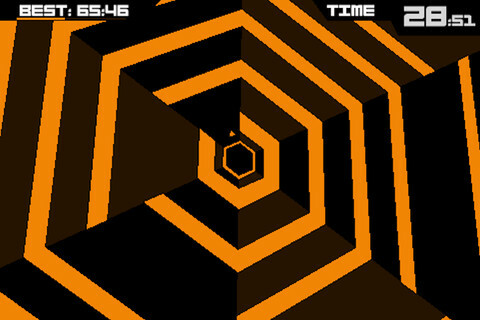 Terry Cavanagh's Super Hexagon will anger a lot of people. Is it a good, scratch that, great game? Yes, but it's also frustrating and difficult, to the point where most people will probably restrain themselves from smashing their iOS devices. Although it'll seem impossible at first, the more you stick with it, the further you'll progress, so long as you're OK with dying hundreds and perhaps thousands of times. 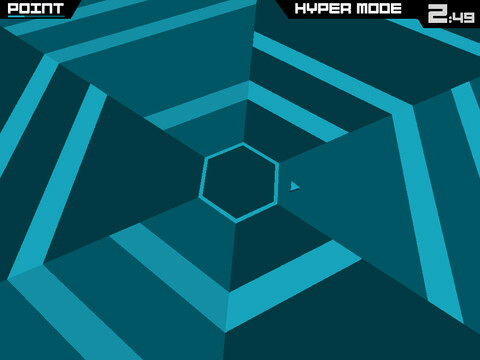 In the game, a never-ending stream of straight lines appear, eventually forming hexagons. Your job is to skillfully guide a triangle through the open spaces as quickly as possible without getting trapped or clipping one of those lines, since touching one results in death. You do this by tapping the right and left sides of the screen to move clockwise and counterclockwise, respectively. Keys to success involve quick reaction time, a steady hand and a little bit of luck. You also need a ton of patience to endure the first several minutes, because you are going to die, perhaps more than you have with other games in the past. The goal is to survive as long as possible, reaching new levels by meeting certain time requirements, but 10 seconds will seem like an eternity, and just because you post a new best time doesn't mean you'll exceed it in the near future. It's the type of experience where you'll reach 18 seconds, then struggle to move past six for several minutes. Of course, the fact that patterns of hexagons change doesn't help, nor does the lack of an easy mode. On that note, yes, Super Hexagon punishes more than it rewards, but the adrenaline rush you get from playing far exceeds any mental anguish. Well, at least until you check out the best times on the Game Center leaderboards. Sobering, to say the least. What's Hot: Addictive and adrenaline-charged gameplay, responsive controls, online leaderboards. What's Not: Will make you beg for mercy.